Despite the name, no cannibalism actually goes on here. From what I can tell. 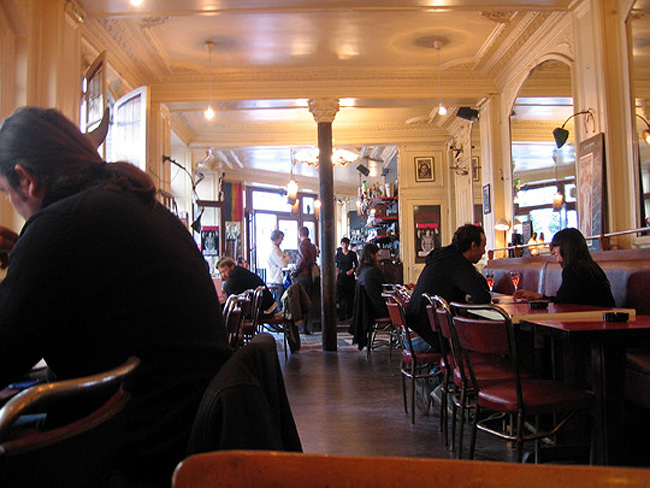 I discovered Cannibale Café when I'd moved to France for the second time and my wifi network at home wasn't turned on for over a month; I was desperate for a quiet, real café (as opposed to a cybercafé  what's internet without coffee?) with free wifi and great ambiance, and fortunately a friend recommended Cannibale! Located at the edge of the neighborhood of Belleville, Cannibale aesthetically feels like an old-fashioned Parisian café, but its clientele is young, hip, and artsy; many afternoons it's a veritable sea of Macs, everyone vying for the few electrical outlets in order to keep churning out all their brilliant whatever-it-is-they're-working-on. Like all French cafés in non-touristy areas, you can order your coffee and hang out as long as you want, reading, computing, etc. You practically can't help but feel poetic and creative sitting and working here. I love having any excuse to be in the neighborhood so I can stop in for a cup. If you're in the mood for lunch, the food is good too!